Celebrate Hanukkah with our Kosher Certified cakes! This is the cake that started the My Grandma's of New England coffee cake tradition, special larger size. It is a double-layered cake made from fresh farm eggs, sour cream and pure Bourbon Vanilla with a cinnamon streusel and whole walnuts. This is the same cake as the Cinnamon Walnut Coffee Cake � only bigger. This three pound coffee cake serves 16 and can be frozen up to four months. This traditional sour cream coffee cake is delicious served with fresh fruit and vanilla ice cream or rich vanilla custard. For recipes see Vanilla Ice Cream Recipe and Vanilla Custard Recipe. Kosher Certified and contains no trans-fats, artificial flavoring, artificial coloring or preservatives! This larger version of our My Grandma's granny smith apple coffee cake. Selections for the Custom Coffee Cake Sampler include Cinnamon Walnut, Granny Smith Apple, Blueberry, Ted Williams All Star Chocolate, Lower Fat Cinnamon Walnut, No Walnut Cinnamon, Golden Raspberry and Cape Cod Cranberry Coffee Cakes. 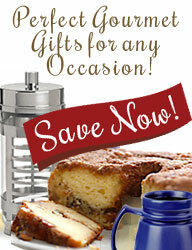 My Grandma�s coffee cakes stay fresh on the counter for a week or can be frozen up to four months. Kosher Certified and contains no trans fats, artificial flavoring, artificial coloring or preservatives!